Atlas Elite Entertainment Music Awards is excited for this amazing event for all artists from across the globe to submit their music from all genres. LOS ANGELES - Jan. 8, 2019 - PRLog -- In 2018 Atlas Elite Entertainment Music Awards launched it's first online music awards and it was very successful. Nine winners and two honorable mention were awarded for a beautiful crystal award. The winners were truly excited for their award. Atlas Elite Entertainment was proud to present the awards to JazzyD (Best Jazz Single), Roberto Tola (Honorable Mention Jazz), LaToya London (Best R&B Single and Song of the Year), Orchestra Fuego (Best Latin Single) Romeo Clinton (Best Reggae Single), Chelle Martin (Best Pop Single), Mike Gino (Best Hip/Hop Single), Tracy Cruz (Honorable Mention R&B), Arthur Jay (Best Gospel Single), Jona Leigh (Best Country Single), and Nick Summers (Best Rock Single). 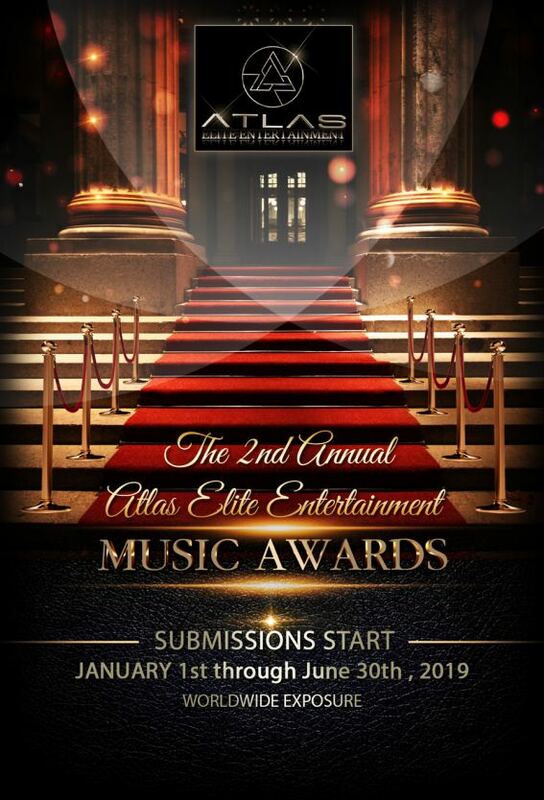 Atlas Elite Entertainment Music Awards is now open for submission for their second annual music awards. Submission is from January 1st though June 30th 2019. The team of Atlas Elite Entertainment, Angel Sessions, Rodney Crews, and Demetrius Guidry together created this amazing award show to support the many great artist from around the world. The online music awards will be July of 2019. The genres are pop, rock, jazz, R&B, Latin, Hip-Hop (rap) Country, Reggae, and Gospel. Jay Ezra, Lady of Lyrics streams thousands on new single "My First Love"
New singles "Vibe" and "Your Love" streams with over 2 million on SoundCloud!